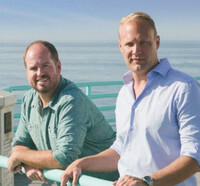 Earlier this week, Manhattan Beach-based PeerStreet (www.peerstreet.com) announced the launch of its online lending marketplace for real estate, plus a $6.1M in a funding round. We sat down with Brett Crosby (who founded Urchin Software, the company which became Google Analytics) and Brew Johnson, the co-founders of the company, to learn more about the company and what it's working on. Photo: Brew Johnson on left, Brett Crosby on right. Thanks for the time today, it's great to get a chance to talk with you about your company. Brew Johnson: It's exciting to be building this business in LA. Brett and I both grew up in Southern California. I grew up in Thousand Oaks, went to USC, and we met each other way back in the 90's. There's lot of great stuff happening here. Brew Johnson: At the high level, it's a marketplace, a lending platform for real estate. The easiest way to look at it, from the tech perspective, is that we are very similar to LendingClub. Investors who have dealt with LendingClub, in terms of returns, are similar to what we are doing, with the key differentiator in that we are secured by real estate. It's a much safer asset case than lenders are playing in. The interest rates are high, but secured by real estate. What's different from what you are doing from other real estate marketplaces? Brew Johnson: Clearly, there are lots of people going after the real estate game online. There's a huge differentiator on how we're doing things. If you take a step back, what most people are doing, is taking a very offline real estate approach, and trying to move it online. Brett and I sat down, and said, how can we take a tech approach and create a positive impact on the existing real estate industry, particularly in the mortgage and real estate finance industry. We figured out a very different approach, which goes along with our background. We wanted to create as much value for the existing players in the ecosystem, the existing lender, and existing borrowers, and existing investors. That was our goal from day one, which is we did not want to compete to make loans. There are many experienced lenders already out there, with a long track record and expertise, who have been making loans for a long time. We said, let's create a technology marketplace and platform that creates benefits for those existing lenders, as well as investors. As opposed to other players in the real estate arena, is we're very focused on a specific kind of asset. That specific type of asset is first position, real estate debt, in an area of real estate that is called hard money loans. Those loans are very mis-priced, in our opinion. We're also 100 percent focused on debt. Where there are lots of players focused on different types of equity, different types of investments, different types of debt, they're doing it in a very unfocused manner. So, we're focused on applying technology more efficiently and creating more value for investors. Plus, we don't make loans ourselves, which we see as unnecessarily risky. There are lots of existing lenders out there, who do a great job of making those specific loans. We're looking to provide value to those lenders, and improve their business. How did you guys start the company? Brett Crosby: Brett and I knew each other since college. We had courses together in college, and got to know each other on a deeper intellectual level, before we got to know each other socially. We built a friendship that has lasted since then. After college, Brew and I went our own ways. He went into law, then into real estate law, and then into technology. I came up with this idea due to a deep obsession with the mortgage industry. I went and started a company called Urchin Software Corporation, which was an early player in Web Analytics, which was acquired by Google in 2005, and then I was at Google for just shy of a decade. I worked on several products, and launched many things. The common theme, was I was buildings and marketplaces in the entire ecosystem. Brew approached me with the idea, and I ended up very early as an investor and advisor, and when it got going, Brew asked me to join me as a co-founder and together, we pulled this company out of the ground and built it up. What was it about this opportunity that made you decide to join the company? Brett Crosby: When I was at Google, there were a couple of things. Number one, I had been approached by a ton of different people to do things. Brett has just the perfect background for this space. Number two, the opportunity in the space is a Google sized opportunity. There's a massive market, and there is no end to the opportunities here to create efficiency and transform things for the better. Anyone who knows this space, knows it's extremely inefficient, and needs lots of improvement. The final thing, is we use a ton of big data and analytics for underwriting, by applying a Google Analytics mindset to this space. It's too big of an opportunity to pass up. What did you learn from your time at Google that you're applying here? Brett Crosby: A lot of things. One, is how to create a more scalable and efficient platform. As Brew talked about that, we are not looking to compete against the existing loan industry. Lenders already have a borrower pipeline, and that's important to the process, and helps to scale and bring in a bigger inflows of deals, which they can cherry pick to put up on the platform. That's great for an investor perspective, and also from the growth aspect. The other thing which is very important, particularly anytime you are building a platform and marketplace, is to make sure you are creating efficiencies in the market, to benefit the other players in the market. In this case, everyone who participates wins. Investors get access to deals and loans, and lenders get more access to capital, borrower get better rates, and it benefits everyone. Brew Johnson: One that that Brett mentioned, and identified early on in our analysis, is it's very important to take Google Analytics type approach to things. You don't use analytics to transform things or change things, or to remove the human element. Instead, you use those analytics to create value in the ecosystem. Where are you now with the service? Brett Crosby: We have been in invitation-only mode for all of 2015, and that's been growing and growing. We're now at the point where we will be opening to the general public and signing up accredited investors, allowing them to get in and invest in an asset that they just haven't been able to do before. What the most important thing you've learned so far about making a marketplace like this work? Brett Crosby: Having demand on both sides of the marketplace is extremely important, and that's sort of obvious. This is not peer-to-peer lending, but it's about letting individual investors get the ability to invest in the same asset class as big institutional investors like Goldman Sachs. This gives you, as an individual, the same access to deals that the big institutions have, and helps level the playing field. We're continually committed to giving individuals access to the same best deals that institutions do. Brew Johnson: The one thing I'd add, since this is very So-Cal focused, is that Brett and I are very happy about the team we've attracted here. It's required people with a background in four different areas, technology, real estate, finance, and law. It's been refreshing for Brett and I see that we've been able to attract amazing people, who are excited about creating efficiencies in what is an old, entrenched business, and who are not just from the technology world. We have people leaving well established careers in real estate, finance, and law, and are commited to doing this in So-Cal, because they believe in this new market. We're creating disruption here, creating a transformative business here which is attrating people from all kinds of backgrounds.